"Be forewarned! CIVILIZATION is a game unlike any other game ever invented ... a game of high-level player interaction with no dice and little risk of any player being eliminated. Object of the game: to gain a level of overall advancement to which cultural, economic, and political factors are important. The winner is the player who maintains the best balance between activities of nomads, farmers, citizens, merchants and adventurers. CIVILIZATION is not a wargame! The game is not won by wars, although some conflicts will occur due to rivalry and land shortage, rather than as a desire to eliminate other players. YOU start at the Dawn of History ... at the point where agriculture has just been discovered and lead your society through the mists of time to the age of the civilized state — 8000 B.C. to 250 B.C. How to Play: starling with a single token, each player moves and increases his units of population as he inhabits selected areas of the board which are fertile and defendable. This era is likely to be marked by small conflicts as the board reaches saturation, but the scope for military expansion is limited by the loss of units in the areas concerned. Indeed, the pressure of population is more usefully absorbed by farming and building cities, which enables more people to be supported and helps to resist attacks. An immediate corollary of the founding of cities is their generation of wealth and their need for an agricultural hinterland. This establishes the use of tokens as revenue. Too rapid a degree of urbanization inevitably leads to an excess of revenue over resources (inflation), and causes economic slagnation. Cities are essential to generate the wealth needed for an advancing civilization, but, unless the wealth is augmented through trade, the nation will be surpassed hy others with more energetic outlooks. Trade itself is subject to such hazards as epidemics and alien philosophies which can have a disastrous effect if a culture has become over-specialized and has failed to maintain a balanced outlook. However, calamities may also provide the impetus from which a well-organized civilization rises in new ways to achieve still further glory. 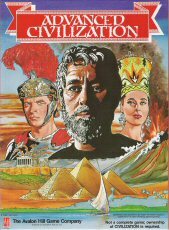 CIVILIZATION is a sophisticated strategy game for two to seven players 12 years and up. Playing Time: Introductory Game — 1 Hour. Full Game — 5 to 12 Hours." 1st printing is the "Parthenon cover" box; 2nd printing is the "Portraits" cover. I believe there is no difference in the contents. • Civilization Card Credit Sheet, allowing players to calculate available credits easily. • No limit on the number or type of Civilization Cards held. 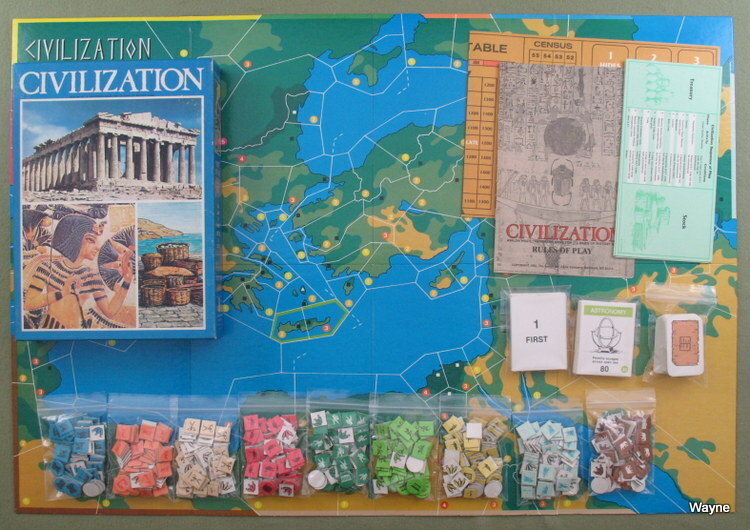 ADVANCED CIVILIZATION retains the essential elements of CIVILIZATION, and can be learned quickly even by those who have never played the original game. The additional Civilization Cards ensure a greater diversity of cultures, while the new Calamities make the game even more challenging. 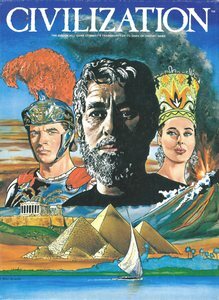 Best of all, ADVANCED CIVILIZATION can be played to completion in one sitting, simply by setting a time limit and determining the winner at that point." 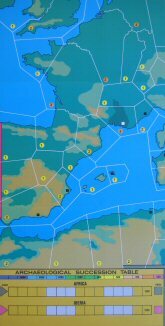 "The West Extension Map (WXM) may be added to a standard CIVILIZATION game to produce a greatly improved four player game and interesting five, six and seven player versions. Iberia starts from any of the three areas on the western (left) edge of the map north of the straits and adjacent to the red border. Africa should use the revised AST table when the WXM is in use but the original table should be used for Africa at other times. Italy is not available as a playing position when the WXM option is used; Iberia now uses the Italian markers. Other starting positions are unchanged..."
No special rules are needed to incorporate these new cards into the game. 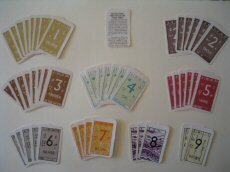 Just shuffle them into the trade card stacks as explained in paragraph 4.2 of the rules and start play. All current rules still apply (especially rule 17.4.3, "Different commodities, even of the same value, may not be combined into the same set."). For reasons of clarity, the last sentence of paragraph 4.2 should be modified to read, "The different value commodity cards for each stack should be shuffled among themselves first." It was intended that each of the sets of ochre and iron trade cards be increased by one card. However, since this would require a new maximum set value to be handwritten on every card, it was decided more expedient just to replace the old sets with new ones. The old cards should be placed aside where they can't get accidentally mixed back into the stacks. One final comment, the contents of this package are not being marketed as a new and official update to the game of CIVILIZATION for the simple reason that they are not to be forced down anyone's throat. Consider them as a kind of seasoning, so to speak; something that can be added or not as one's taste dictates."